The introduction of Z. S. Liang to the Greenwich Workshop family with the release of "Pueblo Street Market, 1920s" was an immediate success. Along with artist Mian Situ, Liang has been dubbed one of the heir apparents to the legacy of master artists Howard Terpning and Frank McCarthy. 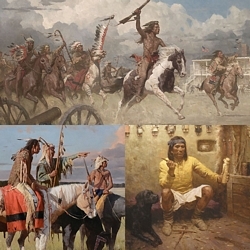 Liang's exceptional talent with color and light is evident in "Pequot Warrior," his stunning first Greenwich Workshop SmallWorks™ release.